Back in the day, I'd call pretty much any rib I didn't slather with sauce, "dry ribs." Not only were they indeed dry, but they looked and tasted like the dry ribs I've always been served at restaurants. It wasn't until I had some excellent dry ribs at Peg Leg Porker, down in Nashville, that I understood just what I'd been missing. So I got to talking to pitmaster Carey Bringle about what sets his ribs apart from the crowd. 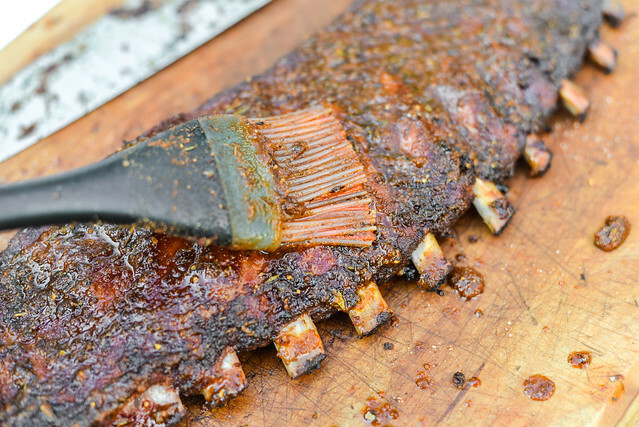 For starters, Carey's ribs more closely follow the Memphis tradition, in which the meat gets slapped with a vinegar mop during cooking, followed by a rub applied at the very end. 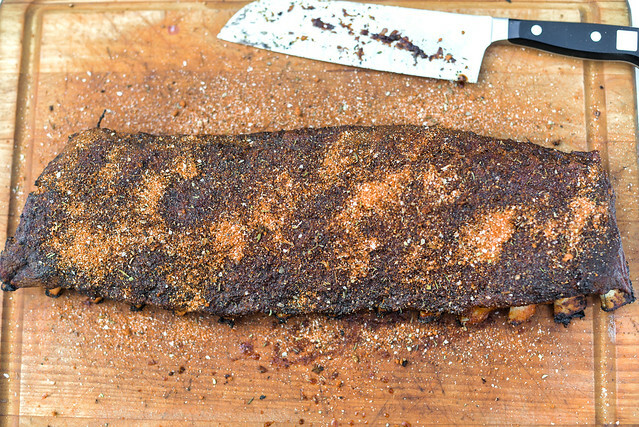 The result is tangy ribs that pack in the full, raw flavor of the rub, making it drastically different from your average recipe—or really any rib I've cooked and labeled "dry" in the past. Trace the history of these dry ribs back to their source, and you'll land at the place synonymous with the style: Rendezvous, in Memphis. 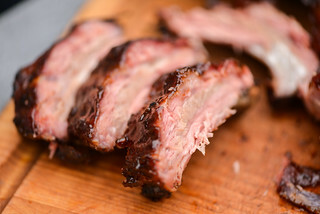 Founder Charlie Vergos first brought ribs to his restaurant in the early 1950s, in an attempt to find a use for the cheap cut—generally considered scraps back then, and priced accordingly. He cooked the ribs in a coal shoot used to smoke hams, grilling them directly over charcoal a few feet below. Influenced by his Greek heritage, Charlie used an acidic vinegar baste that he brushed on the ribs while cooking. Once done, they were coated with a spice mixture that brought together traditional Greek elements like oregano and garlic, with Cajun spices like paprika and chili powders. And so, dry ribs were born (although Rendezvous doesn't like to call them "dry" and you won't find that term on their menu). Regardless, that was the formula I set out to follow, in the hopes of staying at least somewhat true to the original. 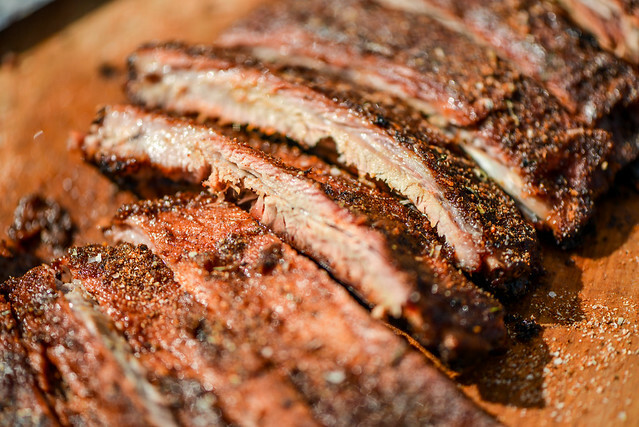 There are many ways that Rendezvous' ribs depart from standard barbecued ribs, but one of the most stark differences is that they're not smoked over low, indirect heat. 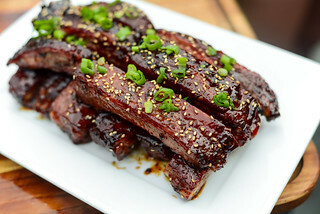 Popular wisdom would tell you that pork ribs need to be slowly cooked in order to render the fat and break down connective tissue in a way that ensures a juicy and tender end product. Well, these ribs throw that ideology out the window, instead relying on cooking hot and fast over direct heat. 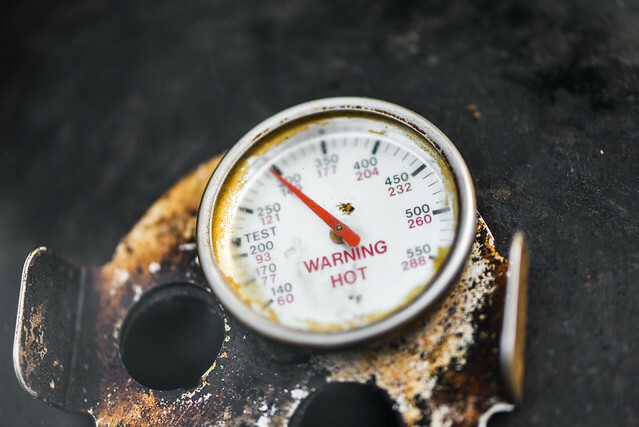 In reality, it's not all that hot, but compared to standard barbecue temperatures around 225°, the 325-350°F range I shot for here is blazing. You can easily hit that temperature range on a standard kettle grill and hold it for the one-to-two hours of required cooking time, but over direct heat, the ribs would burn. 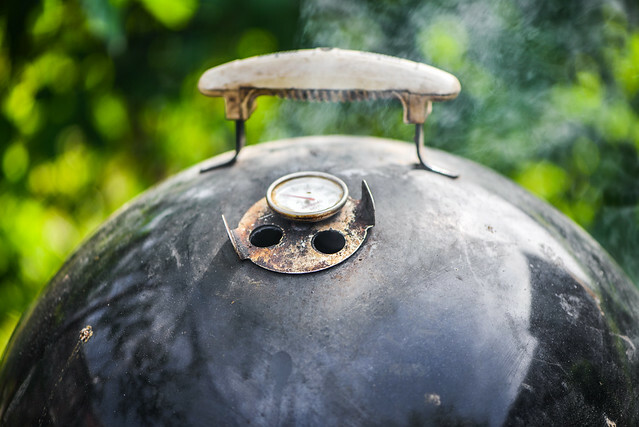 In order to deliver a more gentle heat, the ribs have to placed a safe distance from the hot charcoal—ideally, about two or three feet. Luckily, my Weber Smokey Mountain Cooker presented the perfect solution. This vertical smoker diffuses heat and maintains a low temperature by placing a pan filled with water right above the charcoal. By removing the water pan, I was able to bring my smoker up to a steady 325°F, and place my ribs on a top rack approximately three feet away from the charcoal. If you don't have this type of smoker, you can still pull off this recipe on a kettle grill by using a two-zone indirect fire, in which all the coals are placed on one side of the charcoal grate and the ribs are placed on the cool side of the grill. 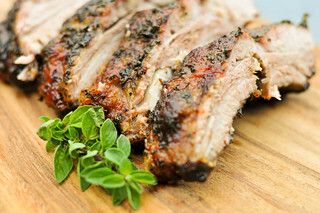 But while this technique will produce fine ribs, you'll miss out on one thing that direct grilling delivers—smoke created by juices and rendering fat hitting the sizzling-hot charcoal. The oddest part of testing this recipe was putting fully naked meat on the smoker. Without any seasoning on them, they just didn't look right. But I stuck with the process, starting the ribs off plain and applying a mop of vinegar, water, and dry rub every fifteen-to-twenty minutes. 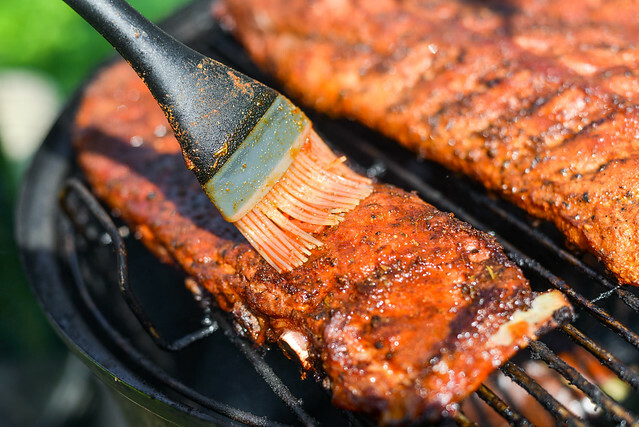 After the first couple brushes, the ribs started picking up a light reddish color, and by the time they were done, they had turned a beautiful burnished mahogany. I tested doneness by lifting the ribs from one end and seeing if they had the slight bend that indicates they're tender, but not quite ready to fall off the bone. I cooked up both baby backs—the traditional Rendezvous choice—and spare ribs that I had trimmed down into a St. Louis-style cut. The baby backs took about 90 minutes from start to finish, while the spares clocked in between two and two-and-a-half hours, depending on how meaty they were. 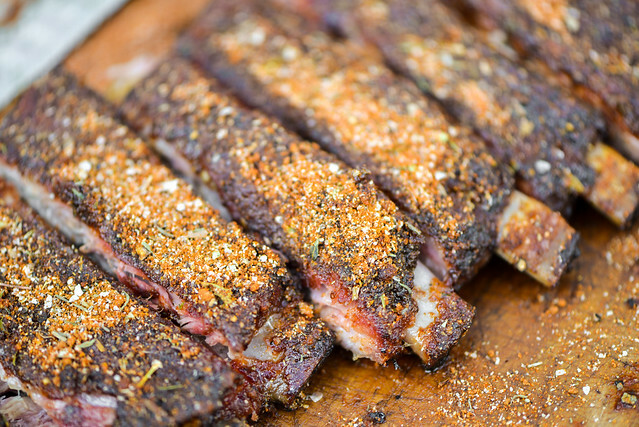 Hot off the pit, it was time to give these ribs their defining characteristic—a dry rub. "Rub" isn't really an apt description here because the spice mixture doesn't get literally rubbed in. Instead, I applied a final brushing of the mop (in order to help the seasoning adhere), and sprinkled the spice mixture all over each rack. There probably aren't many people who can tell you with confidence the exact ingredients in, and volume of, Rendezvous' rub, but I did come up with a mixture of herbs and spices that I think represents the Memphis flavor pretty darn accurately. I started off with a standard paprika base for a nice red color, followed by brown sugar, salt, granulated garlic and onion, celery salt and seed, chili powder, black pepper, thyme, oregano, mustard powder, and cayenne pepper. Altogether, it makes a slightly sweet, slightly spicy rub with a delicate earthiness and an herbal touch that combines both the Cajun and Greek influences in the original. I can understand why you wouldn't want to call these ribs "dry"—they're still tender and juicy. They do have more chew to them than your standard slow-smoked ribs, but there's no world in which the meat would be considered tough or dry. But, as I'd hoped, the dry rub is what really defines this dish. 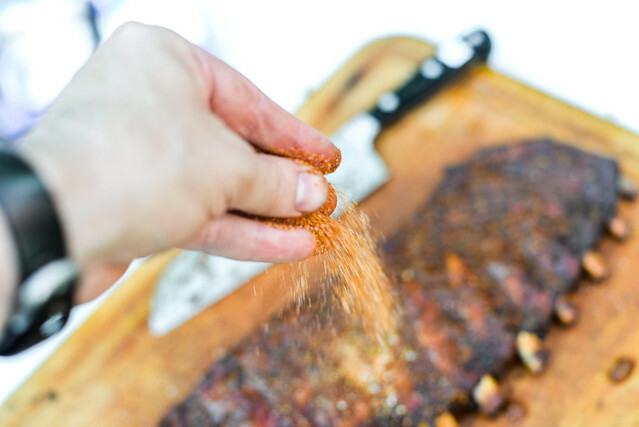 It does give the ribs an herbal, earthy, sweet, and spicy flavor that works harmoniously as a whole, but because the rub doesn't spend hours in the smoker, you're still able to pinpoint individual spices. 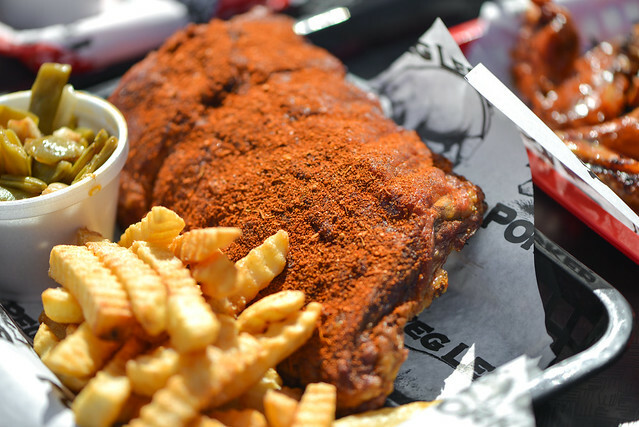 Below the rub, the pork develops a delicate tanginess from all those bastings of vinegar, along with a mellow smokiness from the steaming charcoal. They're certainly unique, hinting at barbecue tradition, but far enough outside the norm that they can't be mistaken for anything other than the Memphis classic. Invented by a restaurant owner from Greece, Memphis dry ribs are bathed in vinegar while being grilled over smoky charcoal, then coated with an earthy, herbal rub once they're done cooking. Just don't let the name mislead you: There's nothing dry about these babies. 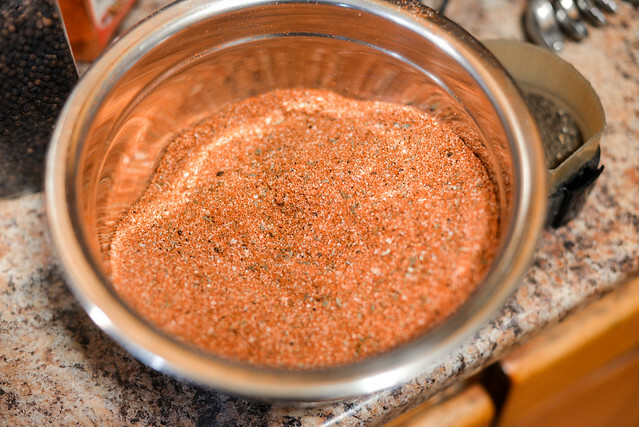 For the dry rub: Mix together paprika, dark brown sugar, kosher salt, granulated garlic, celery salt, chili powder, black pepper, onion powder, dried thyme, dried oregano, mustard powder, and celery seed in a small bowl. To make the mop: Whisk together vinegar, water, and dry rub in a small bowl. Set aside. Fire up smoker or grill to 325°F. 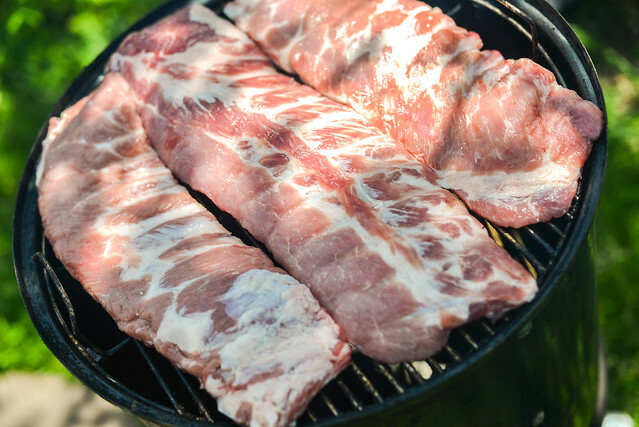 If using a vertical water smoker, such as the Weber Smokey Mountain, place ribs on top rack with water pan removed. 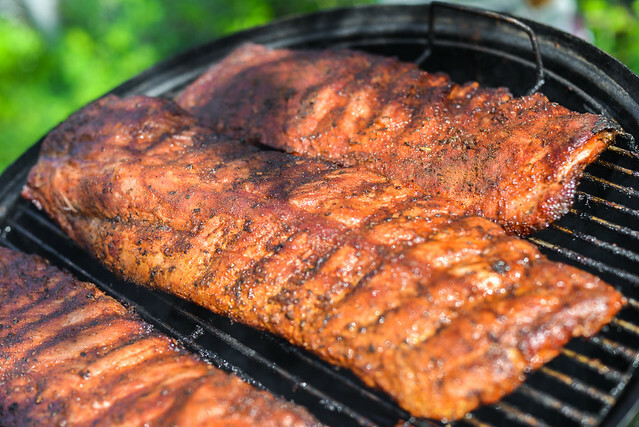 If using a grill or offset smoker, place ribs over indirect heat. Cook until ribs have a slight bend when lifted from one end, about 1 1/2 hours for baby backs and 2 hours for St. Louis-cut ribs, brushing liberally with mop every 15-20 minutes. Transfer ribs to cutting board and brush with mop. Liberally coat ribs with rub and let rest for 5 minutes. Slice ribs and serve immediately. Best write up on Memphis style ribs I have read! You are right, those naked ribs just don't look right on the smoker. Can't really argue with how they turned out though. Thanks for the dry rub recipe. What kind of wood is typical to use for this style rib? I like the shorter cook time and no foiling. Makes life easier when having company. @Bkallday For these, all you need is charcoal. these came out great, only i couldn't keep wsm above 300 even without water pan. i think for hotter cooks like this, lump charcoal is mandatory. tough to get there with kingsford. ended up doing these 3-4 hrs at 250 (spare ribs) and loved it. I do this style all they time on my WSM. I actually use the store-bought Rendezvous rub when I do mine. It's readily available here at many grocery stores here in the Midwest. I prefer the low and slow method of cooking ribs but this is my wife's favorite style.